It’s Father Dave back with you and I’m feeling particularly buoyant tonight! I did a good time in my Monday half-marathon earlier tonight (1:56:20) – pushed along by my boxing buddy, Sol Egberime – and that has no doubt contributed, but it’s not the key reason. The first is for the response I received to what I shared in last week’s Monday Missive about my Al Quds Day dilemma. Thank you for your emails! You may remember that I decided NOT to participate in the Al Quds Day protest two weeks ago, even though I was scheduled to speak, and I had been feeling very torn up about it all, and was feeling that I had not only let down the organisers but the long-suffering Palestinian people themselves! I was both surprised and touched by the size of the response that my sharing generated, and the prayers and support I received from many of my Islamic friends was particularly meaningful to me. Of course not everybody agreed with my decision, but each of you who wrote assured me of your on-going friendship and respect, and recognised that my non-participation in Al Quds Day did not indicate any lessening of my commitment to the cause of justice and peace in Israel/Palestine. My own perspective now, a week further down the track, is that it doesn’t really matter much whether I made the right decision or the wrong one, for God has a way of seeing to it that ‘all things work together for good’ anyway (Romans 8:28), and my petty decisions don’t make a great deal of difference in the end! Ultimately, justice will come! My second reason for feeling cheerful tonight is even more surprising than the first! I had a Good Day in Court! I won’t mention the name of the young man whom I accompanied to court last Friday, but I will say that he is someone we have been working with for a number of years and that the charges he was facing were serious and could have resulted in a prison sentence of some years. the esoteric language and strange procedures that seem to be designed to confuse and intimidate the uneducated. the often jovial interplay between the legal professionals, upon whose whims the fate of so many people depends! And don’t assume that I’m always the bleeding-heart advocate of the accused. I’ve seen as many notorious criminals slip through legal loopholes and walk away laughing as I have seen decent people locked away by a system that treats crimes against property far more seriously than it does crimes against persons! My experience last Friday was one that left me gob-smacked, and what really impressed me was not just the verdict (which was a suspended sentence) but the summation of the judge, which must have lasted for a full 20 minutes! This judge really seemed to understand what it was like for people struggling with mental illness, just as he seemed to grasp the effects that repeated childhood abuse can have on a young man. Good call, judge, and good verdict! As the Judge left the court our lad called out, “Thanks Judge. I won’t let you down!” which was as touching as it was inappropriate in the context (though the boy swears that he saw the judge smile). The experience was not enough to restore my faith in the system as a whole, but it did remind me that it is possible for the system to work effectively and achieve the purpose for which it was designed. In point of fact there were a number of systems in operation that day. There was the government-funded legal welfare team who had been working with the young guy even longer than we had. There was the courtroom system that offered him another chance at life. And now he moves into our system (of sorts) whereby we give him some time out at our campsite, while working with Probation and Parole, etc. 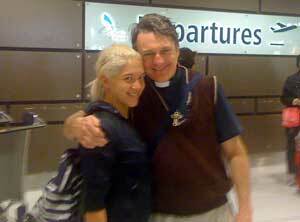 That’s my beautiful eldest daughter, Veronica, about to head off to the USA for a couple of weeks of well-earned holiday. That’s a personality that I wouldn’t expect anybody outside Australia to recognise. 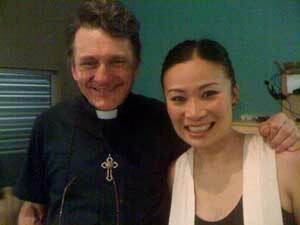 It’s the runner up in the Australian reality-TV show ‘MasterChef’: Poh Ling Yeow. Poh was one of the main guests on this week’s ‘Can of Worms‘ show, in which I also made a brief appearance as an authority on youth violence! I’d suggest that you watch it except that it already went to air earlier tonight. Don’t worry. I didn’t see it either. And nobody rang up either to tell me how I came across, which is probably indicative of the show’s ratings. If you’re really keen though, you’ll eventually be able to watch the episode online here. That’s Peter and Pip Hinman. Pip is a candidate at our forthcoming Council elections with the Socialist Alliance. Pip asked me to speak at a party gathering last Saturday. 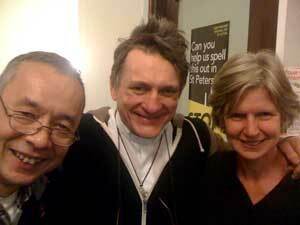 I’m not a member of the Socialist Alliance but I love Pip and Peter so I said ‘yes’. I still can’t work out though why they put me on straight after two comedy acts! Tickets for Lovemore’s next fight! Before I let you go let me tell you that I have multiple tickets available to Lovemore’s next fight. Lovemore will be fighting Rivan Cessaire, and I’ve already purchased 20 tickets for friends and supporters. The bottom line is that if I can’t sell all these tickets I’ll give the remainder away. Just let me know if you’re interested in coming. Financial members of www.fighting-fathers.com will of course get preference with the free tickets. OK. That’s enough from me today. I hope your week has started well. I must confess that I’m in recovery mode at the moment, having dealt with a lot of stress over the last seven days. I won’t try to burden you with all my woes, but I will share one of my struggles with you, and I’m open to your feedback as to whether I handled it properly. Last Friday was Al Quds Day– a day commemorated each year, mainly by Muslim people, to remember oppressed around the world, and particularly the oppressed people of Palestine. That was my understanding of Al Quds up to last Thursday, at any rate, when my perceptions were strenuously challenged. Some months ago I was invited to attend the Al Quds rally in Sydney and to say a few words in support of our Palestinian sisters and brothers. I readily accepted the offer as I feel that there is no group of people in the world today who have suffered so brutally as have the Palestinians people in this generation. Indeed, I take every opportunity I can to express my concern for their suffering and my prayers for an end to the 45-year-long Occupation of their land. Then last Thursday, the day before the scheduled rally, I found myself being bombarded on Twitter with regards to an article that had been published in The Australian that day – an article that labelled Al Quds a hate day, and mentioned me by name as one of the ‘extremists’ who would be echoing Ayatollah Ruhollah Khomenei’s call for the destruction of the State of Israel! Needless to say, I contacted the organisers and started doing more research into the purpose of the rally and the meaning of Al Quds. The guy who had recruited me for the rally directed me to the Al-Quds website. Unfortunately it turned out to be entirely in Arabic – a language in which I am completely illiterate. I did though find some English information about Al Quds and I did indeed confirm that it was started by Ayatollah Khomenei back in 1979. I also read the Ayatollah’s Al Quds speech, and it was indeed an angry response to the crimes of violence that he saw Israel perpetrating at the time. Of course Khomenei’s speech needed to be taken in the context of 1979, and I knew the organisers of this rally well enough to know that they are not anti-Semitic people by any stretch of the imagination, and were solely concerned to see justice done for Palestine. Even so, it still wasn’t clear to me whether or not Al Quds day was itself essentially anti-Israel, and I knew that I couldn’t speak of my concern for the suffering of my Palestinian sisters and brothers if that compromised my love for my Jewish sisters and brothers. My Archdeacon told me not to participate (as one would expect a good Archdeacon to do). Even so, I didn’t want to withdraw my support, and I was convinced that The Australian article was a piece of spin designed to intimidate people like myself and prevent us from participating. I felt I needed more time to work things through, yet I didn’t have any more time, so I chose not to participate, as I just had too many questions. Even so, I felt sick in my stomach. Jesus comes to us all the time in the guise of our suffering brothers and sisters. Was I turning my back on the oppressed people of Palestine, and so closing the door in Jesus’ face?! That’s enough on that subject. We had a wonderful baptism on Sunday morning – welcoming two new young soldiers to the cause of Christ. 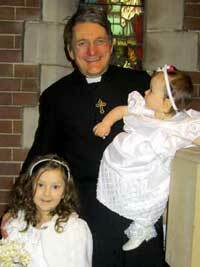 Join me with your prayers for young Rhiannon and Alexandra. I got to preach on one of my favourite passages – Paul’s exhortation in Ephesians 6 to ‘Put on the Armour of God’ (which you can hear here or read here). 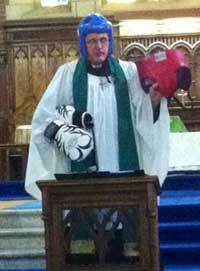 As you can see from the pic, I like to wear my ‘armour’when I preach on this passage. 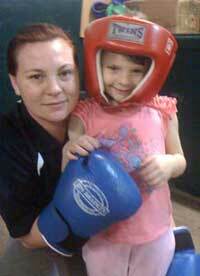 We have some fantastic new fighters developing through our Fight Club. The mother and daughter combination pictured above are two particularly promising prospects! And speaking of great fighters, it seems that Lovemore is going to be fighting again very soon – Friday, September 7th, in fact! This fight will be in Melbourne. We’ll be booking another two tables at this bout for supporters, and we would love it if you could join us, ^fname^. If you can make it to Melbourne to join us, hit me back. You can have the ticket at cost price. I’ll give you all the details you need when I hear from you. OK. That’s enough from me for today. I’ll look forward to catching you next week if not before. In the meantime, remember that if you want to support our work, just join us at the Fighting Fathers’ Member site. Your $10/month subscription keeps us online.